650 Horsepower to Conquer Any Terrain. The 2019 F-150 SC is truly an all-purpose truck. Whether you’re cruising down a highway or blasting across a desert trail, the F-150 SC pulls through with legendary ROUSH performance, style, and refinement. 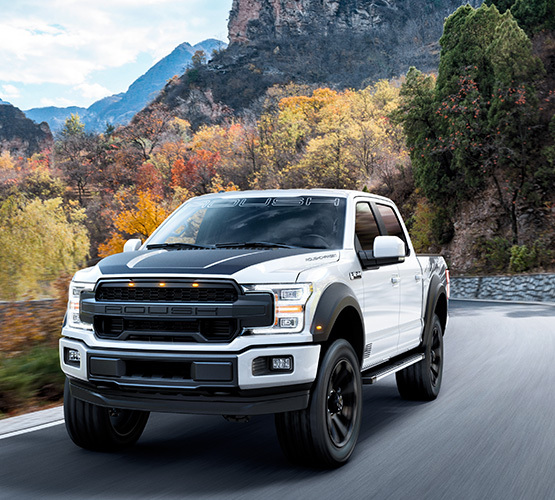 The 2019 ROUSH F-150 SC is engineered for maximum performance on the street, trail, or even picking up lumber. Everywhere it goes it turns heads and ripples with power and performance. 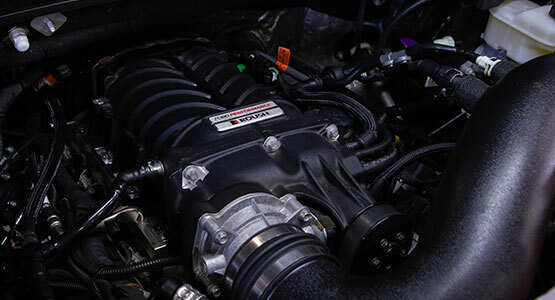 The potent combination of Ford’s 5.0L Ti-VCT V8 engine and the ROUSH TVS R2650 supercharger gives the ROUSH F-150 SC a total output of 650 horsepower and 610 lb-ft of torque, more than enough to handle cross-country highway trips, high-energy trail riding, or towing your boat. Our ROUSH Performance Exhaust System gives the 2019 ROUSH F-150 SC an exhaust note to match its potent performance, while the side-exit exhaust tips offer a touch of sporty style. The optional ROUSH Active Exhaust System uses ROUSH Performance Valve Technology to let you choose between four settings: a touring mode, wide-open mode, sport mode, and custom mode. The included console-mounted dial allows the driver to switch seamlessly between each of the exhausts system’s valve positions for an adaptive engine sound on the fly. 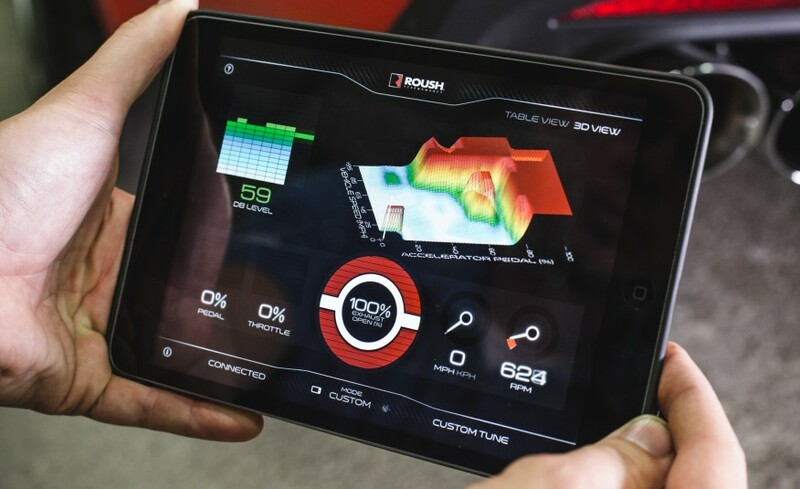 Owners can also utilize our ROUSH Active Exhaust mobile app to select from the preprogrammed exhaust modes or create a custom exhaust profile for a truly personalized sound. Designed to deliver real off-road performance without compromising on-road drivability, the 2019 ROUSH F-150 SC is equipped with the ROUSH/FOX 2.0 Performance Series Suspension System. This upgraded coilover suspension offers a two-inch front lift over stock while maintaining factory capacity for payload and towing. In addition, the ROUSH/FOX 2.0 Performance Series Suspension System provides improved handling and vehicle dynamics over even the toughest terrain. The F-150 SC features custom 20-inch ROUSH wheels wrapped in General Grabber ATX tires for reliable traction both on and off-road. The exterior of the ROUSH F-150 SC features bold ROUSH styling cues, with a custom grille and fender flares that both include our trademark integrated accent lighting. Other body modifications include a front bumper cover that is designed in-house to work seamlessly with Ford's adaptive cruise control system without sacrificing style. The ROUSH F-150 SC offers multiple customizable graphics packages to ensure that your truck can be personalized to match your style while remaining an unmistakable ROUSH performance machine. At ROUSH Performance, it's not enough to deliver heart-pounding performance, unparalleled refinement, and off-road capability. We take a step further and back-up the 2019 ROUSH F-150 SC with an industry-leading 3-year, 36,000-mile limited warranty to show you that we are with you on this ride.